The altar linens, altar cloth, the purificators, corporals and the finger towels used for Mass are specially cleaned and cared for by women of the parish. This small group of parishioners takes turns cleaning and pressing all the altar linens used for that week. 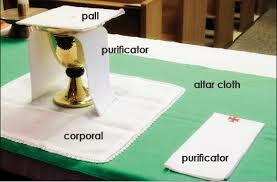 Certain linen colors change depending on the liturgical periods.